Philippines - Apo Island - Marine Sanctuary: Restoring a Coral-Reef Fishery - A marine sanctuary rescues a fishery and coral-reef ecosystem headed for collapse. Thailand - Trang Province - Taking Back the Mangroves with Community Management - Standing up to powerful interests to protect a commonly managed resource triggers a regeneration of society, economy and fishery. Thailand - Nakhon Sawan Province - Watershed Restoration with Agroforestry and Community Forest Management - The adoption of agroforestry farming and communally-managed forests empower impoverished villagers to optimize their resources, both natural and human. Thailand – Nonthaburi Province - Temple Reuses and Recycles, Refurbishes and Resells with Great Benefits for the Poor - A temple combines creative reuse and recycling, sustainable agriculture, and social programs. Vietnam - Dengue Hemorrhagic Fever, Copepods, and Biological Control of Mosquitoes - Community participation enlists a tiny predator of mosquito larvae to eradicate the dengue-fever mosquito, liberating a million people from the disease. Indonesia - Bunaken National Park - Coastal Resource Management - Mangrove restoration and bamboo cultivation provide alternative livelihoods and wastewater treatment. Philippines - Marikina City - Urban Revival - A new mayor's master plan restores the livability and pride of an impoverished industrial city. Thailand - Pak Mun Dam - Experimental Dam Opening - Experimental reopening of the Pak Mun Dam gates reveals the social and ecological costs of megadams, and the benefits of rivers to the multiple communities who depend on them. Willie Smits’ love for orangutans led him to create a rainforest for them. His innovative, integrative technique can serve as a model for similar projects elsewhere. Smits, a native of Holland, conducted his dissertation research on the symbiosis between mycorrhiza fungi and the roots of tropical rainforest trees in Indonesia. In 1985 he began working as a conservation advisor to the Indonesian government and witnessed with great frustration the relentless destruction of Borneo’s rainforests. They were being clearcut for timber, then burned to make way for oil palm plantations. Smits’ sophisticated GIS system for monitoring orangutan habitat only made the problem more clear. Smits had a life-changing experience in 1989, he says, when he saw the saddest eyes he’d ever seen. They were those of a baby orangutan in a cage, for sale at a market. When he returned later that day, the orangutan was on a garbage heap. Smits nursed it back to health, and soon he received other orphaned or confiscated orangutans to care for. In 1991, Smits founded the Borneo Orangutan Survival Foundation (BOS) and built a rehabilitation facility at the Wanariset forest research station. The object was to release the healthy orangutans back into the wild—but the wild was shrinking so rapidly that orangutans found it difficult to survive at all. The great Indonesian wildfire of 1997-1998, which burned 5.5 million hectares (including the underground coal), made the situation much worse. In 2001, BOS began buying land from villagers at Samboja—badly degraded land where only alang-alang grass (Imperata cylindrica) grew. At that time it was a “biological desert,” according to Smits. 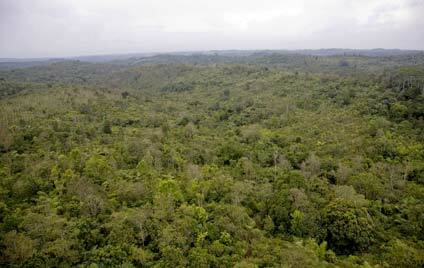 Removing the rainforest had caused the disappearance of all the birds and other animals that lived there. It also led to less rainfall. People were paying about 22% of their income to buy water; crops failed repeatedly, leading to malnutrition and poor health. Unemployment was around 50%, and crime became a problem as well. In all, BOS bought almost 1,900 hectares (4,700 acres) at Samboja. The land was divided into three zones: (a) an outer ring of sugar palms for fire protection and a source of renewable energy (ethanol) superior to palm oil; (b) a rainforest wildlife sanctuary; and (c) the BOS campus, which includes smaller sanctuaries as well as research and education centers and an eco-lodge. It is called Samboja Lestari, meaning Samboja Forever. The first step was to plant fast-growing acacia trees to shade out the toxic alang-alang grass. About 1,300 other tree species were planted as well, at a rate of about 1,000 trees per day. 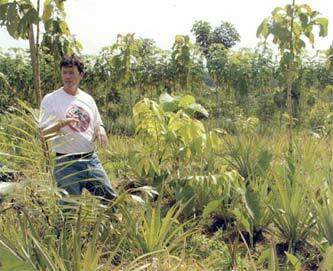 With the help of Smits’ specially concocted organic fertilizer (organic wastes plus sawdust and manure and a microbial agent made from sugar and cow urine), plus fungi and bacteria that serve as natural “nutrient pumps,” the planted trees soon began to resemble a natural, diverse tropical rainforest. As of 2008, many of the trees were two stories tall. According to Smits, about 137 bird species have returned to the area, along with 9 species of primates. The microclimate has improved significantly, with temperatures 3 to 5° C lower than before and rainfall 25% greater. Humidity increased by 10% and clouds by 11.5%. Water is abundant again—enough for Samboja and its neighbors as well. Through an agreement with the local water supply company, Samboja Lestari helps provide water for 40,000 people. Source: Jane Braxton Little. Regrowing Borneo, tree by tree. Scientific American Earth 3.0 18(5), 2008, p. 64-71. Having observed how conservation projects often fail without local community support, Smits made sure that the 600 families of the local Dayak tribe were fully involved. The villagers are paid to work in the nursery, to plant and care for trees, and are allowed to grow food crops (e.g., pineapples, beans, ginger, bananas, papayas) between them. They also make money by growing food (mostly melons) for the orangutans. Thus they have an interest in preserving, rather than destroying, the rainforest. Overall about 3,000 jobs have been created. And this agroforestry system includes far more food than an average rainforest. Smits’ project is based on the principle of integrating people, profit, and planet. A project must be socially acceptable, economically feasible, ecologically sustainable, have a clear legal status, and be science-based, he says. Fairness, cultural values, and a system that is difficult to corrupt are also essential. Renowned scientist Amory Lovins remarked that "the ecosystem is beautifully and comprehensively integrated with the local economy, making the people so much better off. This may be the finest example of ecological and economic restoration in the tropics." If successful in the long term, the project could provide a very valuable model for rainforest rehabilitation all over the world. This case is a good illustration of a system crossing thresholds into new stability domains, both when a dam is built and when it is removed. While dams are being decommissioned increasingly in the US, experimentally reopening gates of a controversial dam in a developing country - -and studying what happens - - is less common. The Pak Mun Dam (PMD) was completed in 1994 by the Electricity Generating Authority of Thailand and funded by the World Bank, despite opposition by 6,000 families who were displaced by the project as well as efforts by local and foreign non-governmental organizations (NGOs) such as the International Rivers Network. Some 152 species of fish returned to the Mun River, 134 of which are migratory (who travel from the Mekong to live, feed and spawn), including the appearance of the endangered Mekong Giant Catfish. Of the 74 types of fishing gear normally used, 22 types had been made obsolete by the dam; after the gates' opening, fishers began using these obsolete types again (fishing gear is directly related to status, dignity and cultural pride for fisherfolk). Villagers reported being better fed. Vegetation along the Mun River began to recover, much of which was used for food, herbs, fish food, gear, rope, timber, household appliances and ceremonies. Land was being used for riverside gardens again. The number of inter-village conflicts decreased. Household incomes went up. In 1990, 32.7% of residents in the target area were below the poverty line; this figure went up to 62.5% in 2000, and fell to 57.6% in 2001. However, the Thai government has since ignored the urging of NGOs and villagers to keep the gates open and decided to close them, and said they will continue to do so for 8 months a year. For more information visit Rivers Watch and a Ubon Ratchatani University study.